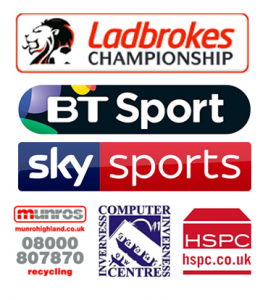 Inverness Caledonian Thistle FC is delighted to be showing our support for lesbian, gay, bi and trans players and fans by wearing Rainbow Laces at our Ladbrokes Championship match against Falkirk on 1st December 2018. Rainbow Laces is Stonewall Scotland’s campaign to change attitudes in sport and make sure that LGBTpeople are welcomed and accepted at all levels of the game. Sadly, many lesbian, gay, bisexual and trans (LGBT) people have a poor experience in sport and have experienced discrimination because of who they are. Research shows that almost half of LGBT people think that public sporting events, suchas football matches, aren’t a welcoming space for them. We can only stop homophobic, biphobic and transphobic behaviour and language from happening in football by showing that it is not acceptable, at every level of the game. We are dedicated to eradicating any forms of homophobic, biphobic or transphobic behaviour and making sure Inverness Caledonian Thistle FC is a place where LGBT fans can be safe and accepted. We need you to stand with us as allies to LGBT people.